With 662 glyphs, Anemos font is the perfect mix of elegant and casual. The Open Type features include a full international character compliment, standard and contextual alternates, swatches, stylistic sets, initial forms, standard and discretionary ligatures (capital letters have at least six different forms and the lower case letters ten). All this makes the text lively and bouncy, without the monotony of obviously repeated letterforms. In addition, we have included some ornaments designed to support the font, some were specially designed to be combined with the letters for a “more calligraphic” effect (access to them through the glyphs palette). Anemos, like all our fonts, was carefully designed, controlled and tested in both aspects: readability and technical aspects. We take care of the kerning pairs, the optimization of the information of suggestions to avoid the pixel grid and the precise programming of the Open Type functions; as well as draw points of smooth curves and the final touch of each glyph. Remember that to access to all additional characters, you must use software that is truly compatible with Open Type, such as Adobe CS applications, or we recommend using the Glyphs palette. 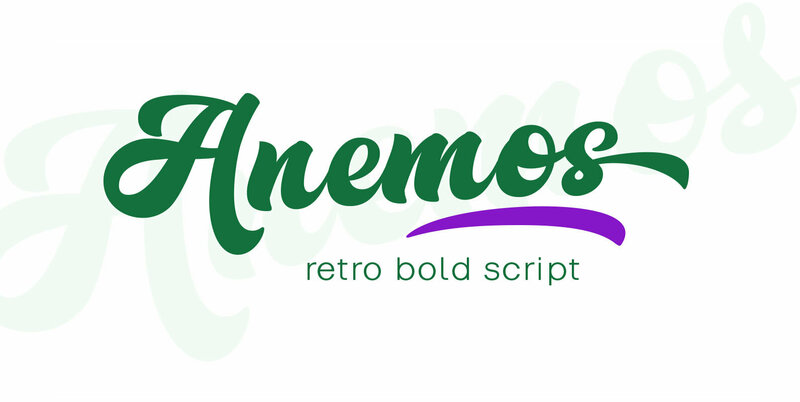 Anemos font can be the option used to create titles, logos and posters for brand and packaging purposes, invitations, greeting cards, magazines and book covers, children's material, fashion, and where you want it.